I.V. Pole, Five-Leg, Chrome; 2-Hook Top 22"
I.V. 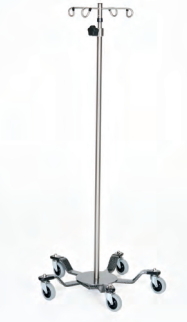 Pole, Five-Leg, Chrome; 2-Hook Top.....22" diameter 5-spider leg base (base weight: 22lbs.) with 3" high scuff-resistant casters.....1" diameter chrome pole with friction lock-knob.....Height adjustable from 50" - 92". Rigid I.V. Pole; Stainless Steel 1/2"